Search For "Building & Construction" Companies in Logansport, Indiana - Click Here Now! For All Your Residential / Comercial Needs, No Job To Big Or To Small ! 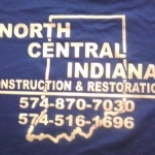 North Central Indiana Construction & Restoration in Logansport is a company that specializes in General Contractors - Single-family Houses. Our records show it was established in Indiana. (745) 161 696 574 870-7030 Call Now!